Oculus Rift has been very powerful and popular; however some shortcomings like storage space problem still trouble game players. Early versions would only install on your system drive, games and apps are always installed to a library in the same location, and if you uninstall Oculus then all your software disappears as well. You may want to migrate from a small HDD to a larger SSD. Is there any tool that could help? 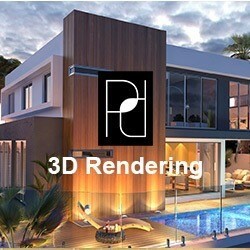 Luckily vrBackupper software is now available. VrBackupper is a complete free and easy-to-use 64-bit Windows 10 program which can back up, restore or migrate your Oculus Rift installation or just your installed games and applications. It helps users protect and manage Oculus Rift and use the device easily. What game players fear is that saved game progress is lost when they restart the game, or reinstall Oculus Rift. In general, vrBackupper is able to backup Oculus Rift covering saved game progress, in-game level, equipment, and gold. The backup process is simple. The program automatically detects your Oculus installation folder, and after pointing to your destination you just need click Start Backup and then everything is done by the software. 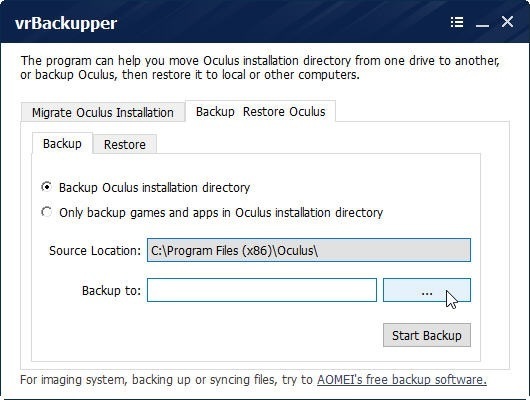 You have the choice to backup Oculus installation directory or only backup games and apps in the directory. 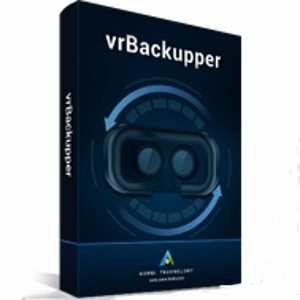 When original Oculus Rift gets damaged, use vrBackupper to recover all data as well as personalized settings; or if you need to move Oculus from an old computer to your shiny new PC, you can just restore them to the destination machine with vrBackupper. As long as your new system supports Oculus Rift, you can continue to play your VR game after restoration. Recovery is just as straightforward: select the source, then select the destination, click “Start Restore” and wait. Oculus VR games can only be stored in the installation directory of Oculus and old versions can only be installed on system partition. With more and more new games downloads, there may not be enough space for installation. 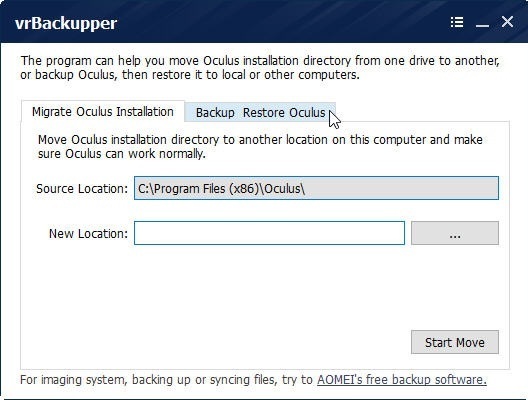 In this case, vrBackupper can be used to migrate your Oculus Rift installation from one drive to another bigger drive – handy if you’re running out of space. 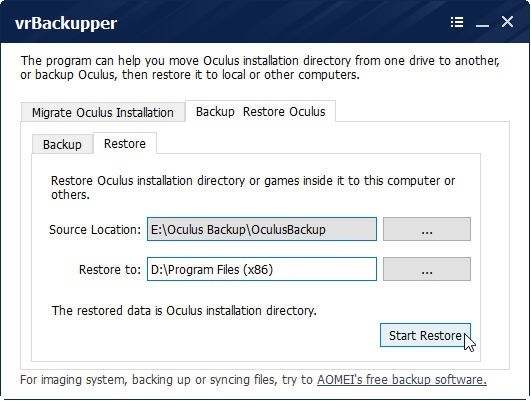 vrBackupper is specifically designed to backup and restore Oculus Rift and its games. It can also move Oculus Rift installation directory to other drives instead of system drive to avoid low disk space problem. If you need full scale PC backup, such as imaging system, backing up or syncing files, you can use the AOMEI Backupper. It will not let you down.